After a long absence of Tough Solar-powered Baby-G watches outside of Japan, the Baby-G G-MS MSG-S200 series will fill that void with a June 2018 release in Asia and a wider release after that. 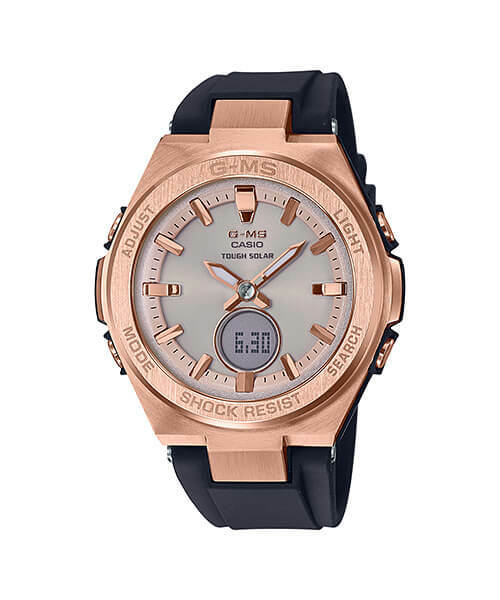 The MSG-S200 is akin to a G-Shock G-STEEL model for women and has an analog-digital display with a stainless steel body and bezel with resin bands. 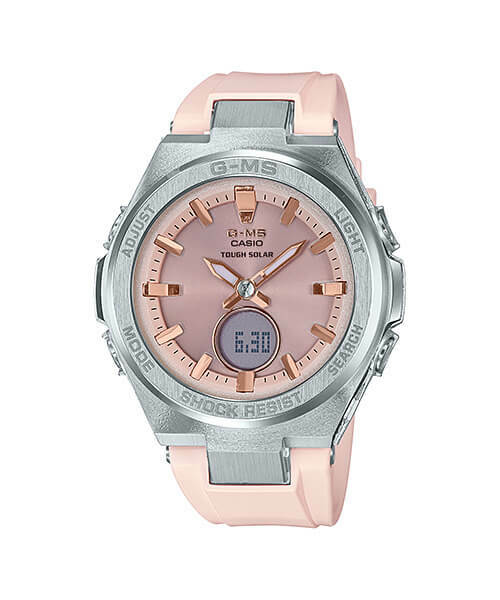 It is not a typical Baby-G watch and does not have Baby-G branding on the front of the watch (just G-MS and Casio logos). It is aimed at the modern and active woman with its more refined exterior style and a smaller form factor with a 34.8mm width and a relatively slim height of 12.3mm. The bezel is made of forged stainless steel which gives it a denser and stronger structure, and it has a brushed and polished finish. The resin bands contribute to its light weight of 39 grams. As a Baby-G model the MSG-S200 features full shock resistance like a G-Shock. Other features include Tough Solar power, 100-meter water resistance, NeoBrite luminous hands, world time, 1/100 second stopwatch (total 59’59.99”), countdown timer (total 60 minutes), daily alarm, battery level indicator, and Super Illuminator LED light. 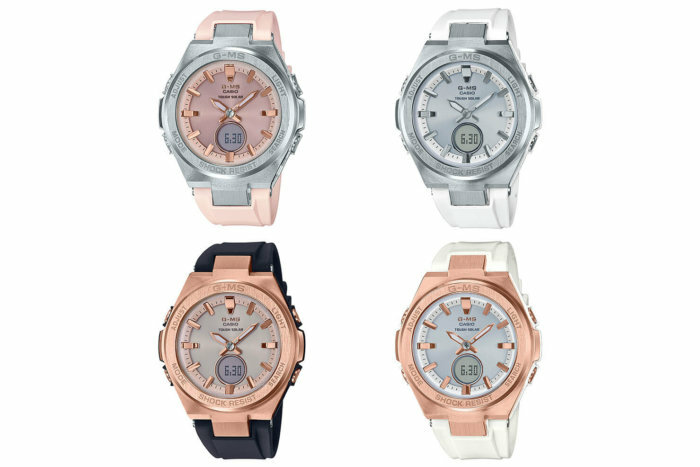 The series will launch with the silver and pink MSG-S200-4A, silver and white MSG-S200-7A, rose gold and black MSG-S200G-1A, and rose gold and white MSG-S200G-7A. Unlike most matching “S” (Tough Solar) and “W” (Tough Solar/Multi-Band 6) series, this series is not a straight model-for-model match of Japan’s MSG-W200 series, as the MSG-W200 series does not have a counterpart to the silver and pink MSG-S200-4A, and the MSG-S200 series does not have one to the all-black MSG-W200G-1A2 or rose gold and pink MSG-W200G-4AJF, though this could possibly change with future releases. The Baby-G MSG-S200 series is also expected to be released in North America (as MSGS200) and worldwide, though China and Europe will most likely be getting the MSG-W200 series like Japan. The MSG-S200 series will also launch in Singapore in the third week of June 2018 with a retail price of $249 SGD at G-Factory outlets island-wide (except IMM). 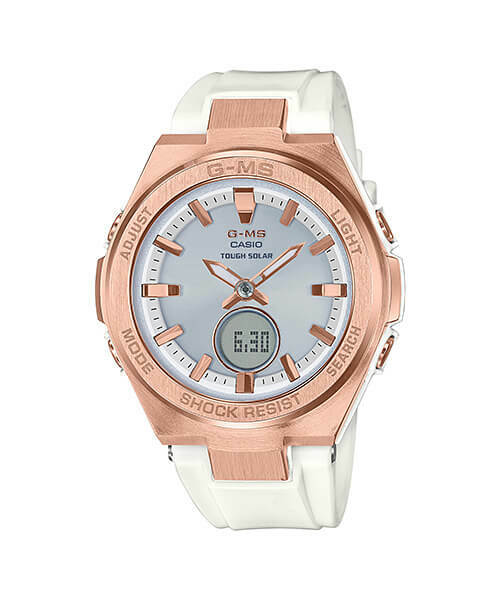 Update: Casio America announced three models: the silver-white MSGS200-7A, rose gold-black MSGS200G-1A, and the rose gold-white MSGS200G-7A with a list price of $150 USD for the MSGS200-7A and $170 for the rose gold models. 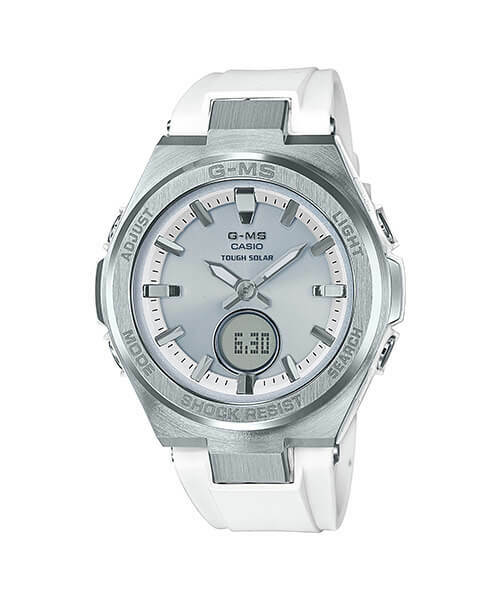 The GM-S line is now under the G-Shock brand in North America. Silver stainless steel bezel with pink bands. Silver stainless steel bezel with white bands. Rose gold stainless steel bezel with black bands. Rose gold stainless steel bezel with white bands.